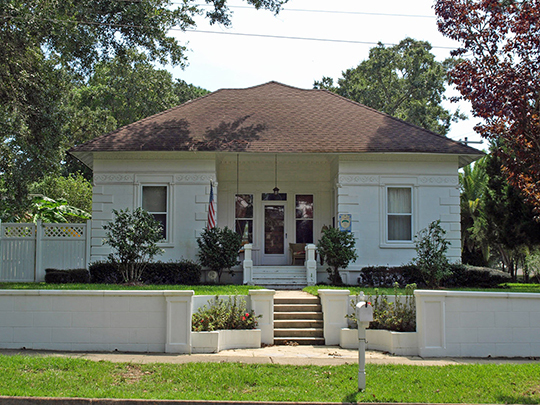 Fairhope City Hall is located at 161 North Section Street, Fairhope, AL 36532; phone: 251-990-0130. Photo: Zurhorst House (Zurhorst-Maumenee House), ca. 1906, 200 Fels Avenue, Fairhope, AL. Built for John Zurhorst by Charles E. Littlefield, an architect who specialized in concrete block construction. Listed on the National Register of Historic Places in 1988. Photographed by user:Chris Pruitt (own work), 1988, [cc-by-3.0 (creativecommons.org/licenses/by/3.0)], via Wikimedia Commons, accessed February, 2014. Fairhope is situated on a sloping plateau along the cliffs and shoreline of Mobile Bay. Fairhope was an idea before it was a place. The intellectual founders of this community were natives of Des Moines, Iowa. Ernest Berry Gaston was the foremost of a group that also included S. S. Mann and James Bellangee. All of these men were upset by the poverty, class conflict, industrial violence and rampant individualism then prevalent in America. Gaston, heavily influenced by Edward Bellamy's Looking Backward, attempted to found a Utopian colony in Louisiana. This colony, however, never got off the ground. He then became active with the Populist Party but was soon disillusioned and became involved with communitarianism again. It was Henry George's Progress and Poverty (1879) that gave the reform hungry Iowans focus for their zeal. George's influential book espoused the belief that social and economic ills could be cured by fiscal reform. George proposed a "Single-Tax" as the answer. George recognized that land is limited and thus distinct from labor and capital. As land cannot be increased, there is no basis for one to claim its income. In taxing away economic rent, the community is merely taking that which it has created independent of any action by the land owner. Taxation of the products of labor or capital would be robbery. George felt that land speculation was evil; community income is lowered, maldistributed and the economy subject to boom and bust. The Single-Tax removes any profit for the speculator leaving land available for it's highest use. The next step was the selection of a site to begin their communitarian experiment. S. S. Mann and James Bellangee embarked on a tour of the southern states seeking a suitable spot. Concurrent with these efforts the small group began publication of the Fairhope Courier, a small newspaper devoted to propagating the philosophy of the Single-Tax and keeping its readers up to date on the Fairhope experiment. The Courier became the official voice of Fairhope for many years. Bellangee and Mann investigated sites in Southwest Louisiana and West Tennessee but were particularly attracted by the prospects of the Eastern Shore of Mobile Bay. This area had a long tradition as a resort for Mobilians. Point Clear's Grand Hotel dated back to 1847 and wealthy Mobilians had built summer homes and cottages at Point Clear, Montrose, and Daphne, the county seat. The site recommended by Bellangee and Mann lay between Daphne to the north and Battles Wharf to the south and consisted of steep bluffs and overgrown pastureland. They reported enthusiastically on the climate, beauty and cheapness of the land. A vote was taken and on 1 October 1894 the Fairhope Single-Taxers chose Baldwin County, Alabama as the location of their experiment. In November twenty-eight men, women and children made the long trek from Iowa to the Eastern Shore, boarding with Mobilians in Battles Wharf. The Fairhoper's first land purchase in January 1895 included 135 acres on the bay between two gullies, extending inland half a mile. They very quickly followed this with other purchases and by 1910 owned over 4000 acres. Since then the Fairhope Single-Tax Corporation made several more purchases, none of them of significant acreage. As a townsite the area offered few advantages. The land was of marginal agricultural value and covered with pine trees. An attempt to found a town there before the Civil War never got off the ground, though Alabama City shows on some old maps. Steep bluffs met the bay, some as high as fifty feet, making an arduous climb from the beach. The bay was very shallow with a gently shelving bottom, hindering water transportation, which was vital to survival. Despite these practical difficulties the colonists very quickly made a decision regarding the bluffs and beachfront. Believing that no individual should own scarce community resources, they set aside the waterfront and bluffs as parkland. They then quickly began to draw off streets and lots. Access to the water was of primary importance so a roadway was cut down the bluff to the beach. Colonists began hauling lumber from schooners up this incline for construction of their new town. Fairhope and Magnolia Avenues were two of the first streets to be laid out. These streets are parallel until just east of the bluff where Magnolia curves into Fairhope. From here Fairhope Avenue descends the steep bluff to the water. By March 1895, five houses and a store had been constructed. Commercial development would center on Fairhope Avenue where it joined a north-south street called Section. The need for a wharf was critical and in the Spring of 1895 wharf certificates were issued and construction soon begun at the foot of Fairhope Avenue. By the summer of 1896 Bayview Avenue was cleared and by February 1897 Section Street was extended further north to the gully. The Fairhope Industrial Association had no power of taxation People leased the land for 99 years while the FIA collected the annual rent necessary to capture the whole of the economic rent from the land under lease. Membership in the FIA cost $100. Very soon colonists were faced with non-members wanting to lease their lands. Their decision to allow non-confirmed Single-Taxers to participate would eventually lead to tension and legal conflict, which continues to this day. Early provision was made for a school and a lot on the corner of Fairhope Avenue and Section Street was set aside for the purpose. Students of Single-Taxers were charged fifty cents and others a dollar. The initial enrollment was 26. Despite its rude and difficult beginnings, Fairhope developed along aesthetic lines. Streets were planned to widen out towards the bay, giving everyone a view and early provision was made for planting trees and flowers. With its healthful location the town almost immediately began attracting seasonal visitors. As early as October 1896 one C. L. Coleman applied for a lot on Magnolia Avenue, "for the purpose of building thereon cottages to rent to transient visitors. 11 (Courier, 10/12/96). Though many of these people were Mobilians, others were intellectuals from all over the world, intrigued by the Single-Tax experiment going on in the deep south. One of the most influential of these early intellectuals was Marie Rowland who came to Fairhope in 1899. The 100 residents welcomed this woman from the Credit Fancier Sinaloa Colony in Mexico. They also welcomed her 1200 volume library. She served as an associate editor for the Courier and opened her house as a public library. From its beginnings, Fairhope was to show an appreciation for the artist and the intellectual. Despite Fairhoper's devout interest and belief in the Single-Tax, Henry George himself did not approve of the experiment. He was afraid the colony would fail in an unfriendly legislative atmosphere and thus hurt the idea of the Single-Tax. Other prominent Single-Taxers took an active interest however. One, Joseph Fels, a Philadelphia soap manufacturer, gave considerable sums of money to the town. The Fairhopers governed themselves through a council. Gaston was the secretary, or leader. True to Fairhope's avant-garde image, women were allowed to serve and vote on the council. These early Utopians were people of modest material means. Yet they were intelligent and industrious. Fairhope became a town with no rich and no poor, fired with reform spirit. A cemetery was set aside in 1900, burial free to members. For the living, the colony's first steamer or bay boat, began service to Mobile in 1901. The physical development of the town proceeded apace. In 1904 the Fairhope Improvement Company was formed as a joint stock company with a capital stock of $25,000. Organized by R. F. Powell, an ardent Single-Taxer, the FIG planned to construct vacation cottages on colony land. In its first three months the FIG constructed six cottages (10 & 12 Fels still stand) and eventually added a bakery and planning mill as well as operating the steamer "Fairhope." By 1904 Fairhope had grown to 400 residents. The Fairhope Industrial Association became the Fairhope Single-Tax Corporation under Alabama law. In 1905 a new school building was constructed, "with two splendidly lighted rooms and a hall ten feet wide through the middle." (Courier, 2/3/05). Because of its belfry, this became known popularly as the Bell Building. Education in Fairhope was changed forever with the arrival of Marietta Johnson in 1902. A native of Minnesota and graduate of St. Cloud Normal School, Johnson assumed duties as a teacher in Fairhope. Her philosophy had been profoundly affected by several books which stressed the education of the whole child; body, mind and spirit. Called "Organic Education," this approach was used by Johnson beginning in 1907. Her school was free to locals and distinguished by the lack of formal academic strictures. By 1908 there were 50 students. Johnson's school received enthusiastic praise from all over, the country. John Dewey profiled it in his Schools of Tomorrow (1913) and notables such as Upton Sinclair and Clarence Darrow made visits. In 1910 the Bell Building was purchased for the Organic School and soon a ten acre campus was provided, by the Single-Tax Colony. Together with the Courier, the Organic School became closely identified with the Single-Tax experiment. In 1908 Fairhope incorporated. Thereafter residents looked to the municipality for services and protection. Though slow to develop, this division into city and Single-Tax Colony would widen over the years. Fairhope's attraction as a resort and vacation spot continued to develop. Hotels and Inns with names like the "Canuck" were common. The best known of these establishments was the Colonial Inn with its two tiered gallery constructed in 1909, on a bluff south of Stack's Gully. More modest hotels included the Hotel Murray, "a few doors down Magnolia Avenue, one of the best residence streets." (Fairhope on Mobile Bay, Fairhope Courier, p. 23 Sept. 1915). Private residences were unabashedly modest. A promotional brochure in 1915 noted, "Fairhope abounds in modest cozy homes. The palaces of the "predator rich" are not found in Fairhope." The Courier noted the absence "here of the shanties and dilapidated buildings which are found in some quarter of almost every town." (Courier, 11/15/04). The lack of a rail connection was viewed as a hindrance to community growth. Gaston reasoned that a rail link with Robertsdale, 14 miles to the east, would not only increase the accessibility of colony land but improve the prospects for farming in the area by providing an easy market center. Throughout 1913 efforts were made to provide Fairhope with just such a rail connection. Robertsdale, connected by a spur off the L&N from Bay Minette in 1905, was prospering as a " truck farming center and was attracting immigrants from the mid-west in growing numbers. Despite the advantages of a link with Robertsdale, no more than a mile of track was ever laid in Fairhope, from the pier, into downtown and the project was soon abandoned for lack of funds. Efforts at growing satsumas on colony land met with a little better success until several freezes illustrated the futility of this project. Despite these setbacks, Fairhope continued to grow and prosper as a resort. The Single-Tax Colony was proud of the fact that by 1915, with municipal limits of a mile and a half, 4/5 of the population and all the business was on its land, even though it owned less than half the land within the town limits. To many, this was a vindication of the Single-Tax philosophy. Gaston noted in 1920 that many newcomers simply accepted the Single-Tax as the status-quo. Fairhope's population at the time was 853. Downtown's rude wooden buildings began to be replaced with more substantial brick, block and tile ones during the 1920s and 1930s. The local contractor Marmaduke Dyson, an English immigrant, constructed many of the new buildings. His company promised, "Individuality and distinctiveness can be incorporated into your new home or building through employment of the natural resources of our locality." (Courier, 4/7/27). Dyson and Company built the Gaston Building (1924), Post Office (1932), Bank of Fairhope (1927) and Bloxham Building (1932) in addition to dozens of residences. The work of formal architects is rare in Fairhope, one example, however, is the Bank of Fairhope (1927) designed by Mobile architect William March. In 1932 the Single-Tax Corporation turned over all parkland to the city. This continued the drift between the FSTC and the city. After 1932 the FSTC was concerned with its own administration and the city had a life of its own. Construction of the Causeway in 1927 put the bay boats out of business and cut into tourism. Before construction of the Causeway, travelers between Mobile and Florida found the huge Fairhope wharf the most convenient jump-off point to cross Mobile Bay. The Causeway provided a motor route to the north across the bay and eliminated much of the traffic through Fairhope. Fairhope remained a popular haven for Mobilians and Northerners familiar with the town however. The community's high rating in Safe Places East during the 1970s encouraged a spate of retirees into the community. Today (1987) Fairhope's population is just over 7,000. The Courier, now known as the Eastern Shore Courier, continues publication, though no longer wed to reform issues. The public pier and beaches are intensively used by the public and the present mayor is committed to beautification and downtown revitalization. The town holds an annual Arts and Crafts Festival and the Single-Tax Corporation continues its 93 year commitment to the economic philosophy of Henry George. Was the Fairhope experiment a success? How did the founders feel about their efforts? E. B. Gaston himself felt that Fairhope was a success in that a model community had been created. Yet a missionary effort was never developed and no other town in Baldwin County converted to the Single Tax. In this sense, Fairhope was a failure. Within the national context of Single-Tax experiments, Fairhope was the first and largest. Others soon followed, including Arden, Delaware (1900) and Free Acres, New Jersey (1907). Yet these were much smaller than Fairhope and though they still exist, Fairhope is the most important of the three. Fairhope's significance lies in the fact that the entire community was founded on and guided by intellectual principals and Utopian ideals. Despite the town's gradual evolution into the municipal mainstream, the concept of the Single Tax remains at the core. John Sledge, architectural historian, Mobile Historic Development Commission, Historic Resources of Fairhope, Alabama, nomination document, 1987, National Park Service, National Register of Historic Places, Washington, D.C.